We were talking about Sarah Paulson and her impersonation of Kathleen Turner on David Letterman. Check it out on the You Tube clip forwarding it to about 4:40 to hear Kathleen and some Holly Hunter, too. We thought that instead of doing, Cupid, she should just be a regular on the talk show circuit. Many years ago, there were people who were not television or movie "personalities" but they were regulars on talk shows; people like Truman Capote and Edith Head. There was recently a lovely, illustrated reprint (actually a reedit) of Head's famous book, The Dress Doctor. 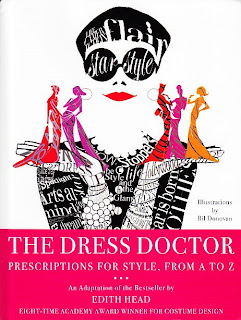 The Dress Doctor: Prescriptions for Style, From A to Z is my favorite kind of book, an abecedary. As you may recall, my last post was about Beverly's breakfast pictures of my blackberry jam. 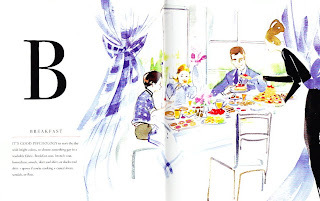 In The Dress Doctor, Head gives the following suggestions for what to wear for breakfast. It's good psychology to start the day with bright colors, so choose something gay in a washable fabric. Breakfast coat, brunch cot, housedress, smock, skirt and shirt, or slacks and shirt + apron if you're cooking + casual shoes, sandals, or flats. Beverly did not send me pictures of what she was wearing when she served my blackberry jam to her family. I'm sure it was a bright and colorful housedress. Or perhaps it was her Sunday brunch coat. Where does one purchase a "brunch coat" or a "breakfast coat" for that matter? This morning I served breakfast in black sweatpants and a black, T-shirt. Fortunately, my cats have never heard of Edith Head. Still... I am rather fond of the "smock" as an apparel of clothing and purpose that we start a movement to return the smock to everyday apparel. I'm sure Edith Head would approve.